Brandon Bye (left) scored the winning goal for the Revolution last Saturday against Minnesota. After snapping a four-game winless run with their first victory of the season last Saturday, the Revolution will try to turn that momentum into a road result against the Eastern Conference front-running Columbus Crew on Saturday night. 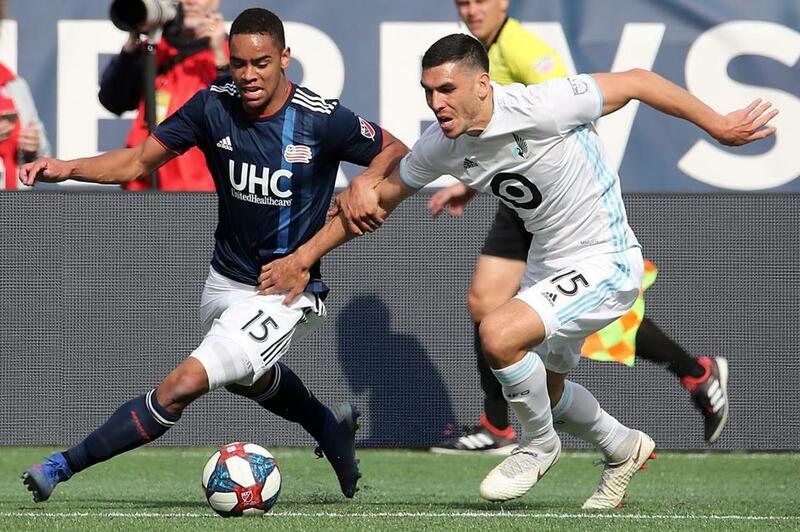 The Revolution’s reversal of fortune was made possible by a changed lineup, new formation, and aggressive attacking approach in a 2-1 victory over Minnesota. But the Crew have been tough defensively this season, keeping three clean sheets, including a 2-0 road win over New England. How can the Revolution break down the Crew backline? With Harrison Afful out at least six weeks with a fractured jaw, a big part of the Crew’s offensive and defensive schemes will have to change. The Crew are still talented without the Ghanaian international, featuring the creative Federico Higuain and the clinical Gyasi Zardes. But the element of that overlapping run down the wings is less of a threat than it was in New England’s first matchup with Columbus. New England can narrow its defensive focus to target Columbus’s two offensive talismans, making it a simpler approach this time. It worked last Saturday, and it was the opposite approach that resulted in home losses to Columbus and Cincinnati. So, why do anything else? The Revolution upped the speed on the wings, employing Brandon Bye and DeJuan Jones — two of the fastest players to come out the MLS SuperDraft in recent years. It paid off with Bye scoring the winner and Jones picking up an assist and some confidence on the ball. You can expect a similar tactical alignment Saturday night at Columbus with an emphasis on stringing passes together moving forward. We’ve said this before. But it’s crucial against Columbus. Yes, the Revolution boast speed throughout the field, but the Crew attack is known for sneaking in behind the defense. The Revolution could benefit from playing the offside trap to frustrate Zardes. In addition, the high line would restrict Columbus’s lateral movement upfield, forcing a slower buildup that’s easier to break down. ■ When, where: Saturday, 7:30 p.m., MAPFRE Stadium, Columbus, Ohio. ■ Coaches: Revolution — Brad Friedel; Crew — Caleb Porter. ■ Formations: Revolution — 4-3-3; Crew — 4-2-3-1. ■ Goalkeepers: Revolution — Cody Cropper; Crew — Zack Steffen. ■ Head to head: The Crew won this season’s first meeting, 2-0, on March 9 at Gillette Stadium. ■ Out: Revolution — M Isaac Angking (knee), F Justin Rennicks (hamstring); Crew — D Milton Valenzuela (knee), D Harrison Afful (jaw), M Niko Hansen (thigh). ■ Miscellany: Crew midfielder Federico Higuain moved into 25th in MLS in career assists, collecting his 60th in last Saturday’s win over Atlanta . . . The Revolution’s last regular-season win at Columbus came in October 2013 (1-0). They are 0-4-1 since . . . Revolution midfielder Carles Gil leads MLS in possessions gained in the attacking third with 14, and ranks third in chances created with 13 . . . New England leads MLS in possessions gained in the attacking third with 46.